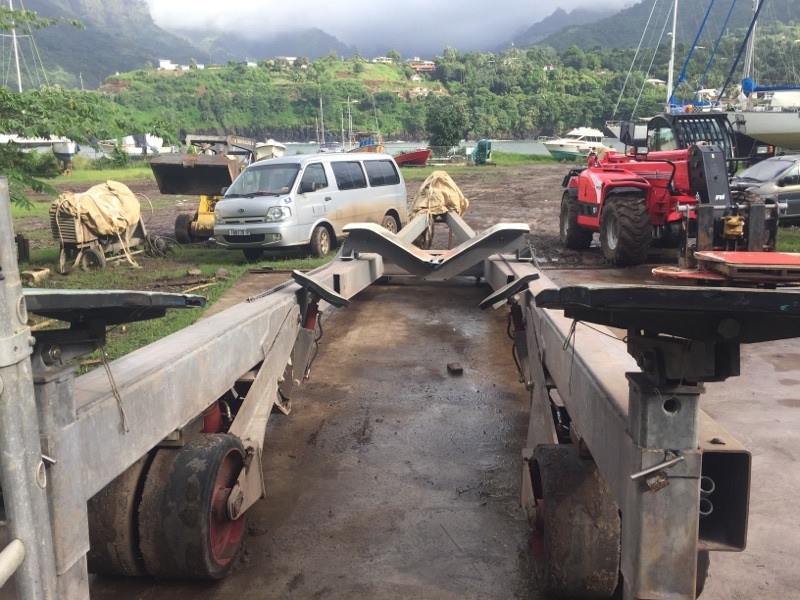 The answer turned out elusive… it began with a visit to the yard on Monday morning 8am, after our overnight passage from Fatu Hiva. They say that “misery loses company”. In this case, seeing other people’s misfortunes really put our own qualms into perspective. Aldebaran’s repairs seemed trivial compared to the far more serious complications that had befallen other sailboats crossing the Pacific. I immediately felt much better about our situation! Still, it was tough to find clarity to make our plans. “We’ve never hauled out a trimaran,” explained the yard owner Vincent. He is a super nice, young French guy married to a local Marquesan lady. He showed me their hydraulic trailer (towed by a tractor, see pic below), used to pull boats out of the water. There was a 60 foot sailboat in the yard, so size was not a problem. The issue was whether Aldebaran’s unusual hull shape would fit his trailer’s dimensions, designed for typical monohulls and catamarans. Armed with photos of the boat out of the water, we debated different approaches. Using the VHF radio, I called Sabrina onboard to measure different lengths and angles. Vincent was limited on time, however. “I’m sorry, but I need to leave for the airport,” Vincent excused himself. He wasn’t leaving on a flight- he was going to fix an airplane! During the next times I visited he was always “at the airport”. Yet I persevered, leaving our boat plans with his assistant, drawing out potential options. But no answer came. To make the most of Deena’s last few days with us, we took a four day trip to the nearby island of Tahuata. When we came back, I went hunting for Vincent. He finally gave us the thumb’s up! To add to the good news, the estimated cost of the haul out is very reasonable, only about $1500 – assuming we do all the work. We scheduled to haul out the first week of July. This was the best timing in between the next crews that come to visit us. They’ll each lose a few days from their respective trips, but we are all making compromises to get the boat what it needs: a proper repair. YAY! Sounds like good news for now…love the photos!! Nice!!! The trip is lining up. Proper boat repair will get done. Asher’s new passport arrived. We are cleared for take off! A good deal to haul out. Still have a question, one others may be asking, too. Wouldn’t careening be almost as good as hauling out, since you’re doing all the work yourselves? Is a 6 +6 = 12 hour tidal revolution not enough time to remove rotted FG/plywood sandwich, completely dry it out (maybe with the help of a DC heat gun? ), repair with FG and resin and completely dry cure…. before the next high tide and very likely sea water splashing under the wing in the affected area?